This anthology is a collection of solo guitar transcriptions ranging from intermediate to concert level material. Many of the pieces are by some of the best known composers of the baroque era like George Frederick Handel and Johann Sebastian Bach. There are also some unique gems by lesser known composers that merit playing because of their very musical and memorable nature. Among the advanced pieces are Bach's Prelude and Fugue No. 1 from the Well Tempered Clavier and an exquisite Air by Handel. Though very different these two pieces in particular exemplifying the sophistication of baroque contrapuntal writing. 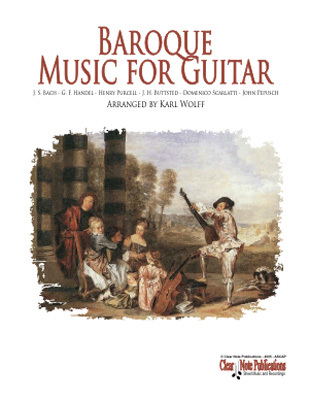 The collection also includes charming examples of the Minuet, Sonata, Theme and Variations forms of the baroque era by Scarlatti, Purcell, Buttsted and Pepusch. This is a collection to savor over many years, full of pieces that will delight and challenge any guitarist.